Carpenter ants have become a widespread problem throughout the Okanagan Valley, especially during the Spring season. As the weather warms up, carpenter. BugMaster Pest Control is familiar with a wide variety of crawling and winged insect throughout the Okanagan Valley, including carpenter ants. The best defence is properly detecting, disbanding and preventing future infestations. Carpenter ants are as common as they are destructive, which is why early detection is essential. They are black ants with segmented bodies that measure in at ¼-⅜ inches long. Although carpenter ants do not resemble termites in appearance, they are similar in that they eat wood, which will leave it hollow and weak. Early detection is essential as their colonies can contain up to 50,000 ants! Common signs of a carpenter ant infestation include seeing ants crawling in your building or home, particularly crawling out of holes or crevices, hearing faint rustling noise in walls and finding piles of wood shavings near wood. They will enter your home to nest inside wood or forage, they can travel through walls and ceilings, and will ruin your home’s wooden infrastructure. If you noticed these signs, it’s it’s important not to ignore them. Once you’ve confirmed an infestation and located the nest, contacting pest control immediately will help ensure they’re properly and safely removed. Effective treatment can only be administered by professional pest control technicians. Our technicians at Bugmaster have a great deal of experience in dealing with these unwanted guests, and will properly disband your carpenter ant army! During the extermination, we will case the exterior of your property in order to locate any points of entrance, tunneling and nests in order to protect the structure from further carpenter ant foraging. We recommend contacting reputable pest control professionals as soon as possible. The sooner you evict your unwanted house guests, the better! In the Okanagan, we also have a specific Carpenter Ant. If you find an ant which is coloured black/red/black, black head, red middle, black end, that's it! These are very similar to the regular Carpenter Ant, but are specific to our region. It’s not uncommon for BugMaster Pest Control’s phone to ring off the hook during Spring from residents living throughout the Okanagan Valley who are dealing with an infestation of ants. Prevention is key if you’re one of the lucky residents that isn’t struggling to claim back your territory, or if you’ve recently rid your home of an infestation. Once your carpenter ant infestation has been eradicated, it’s essential ensure your home is protected against future invasions. Seal any entrance points, such as doors, windows and any cracks or holes in your foundation. Ensure you keep food in airtight containers and keep surfaces clean of food and drink spills. It’s also important to trim trees and brushes that are near your home. 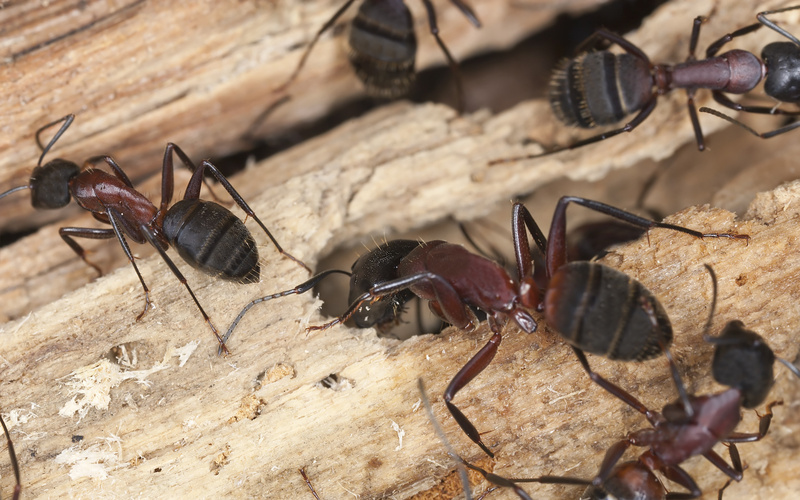 Don’t hesitate to Call Your Kelowna BugMaster Team if you suspect a carpenter ant infestation today!